The Hong Kong Film Directors' Guild 30th anniverary dinner and awards took place two nighs ago. Chief Executive Carrie Lam Cheng Yuet Ngor was invited to speak as a guest. The event presented seven awards. Best Film went to PROJECT GUTENBERG (MO SEUNG). Felix Chong Man Keung received Best Director. 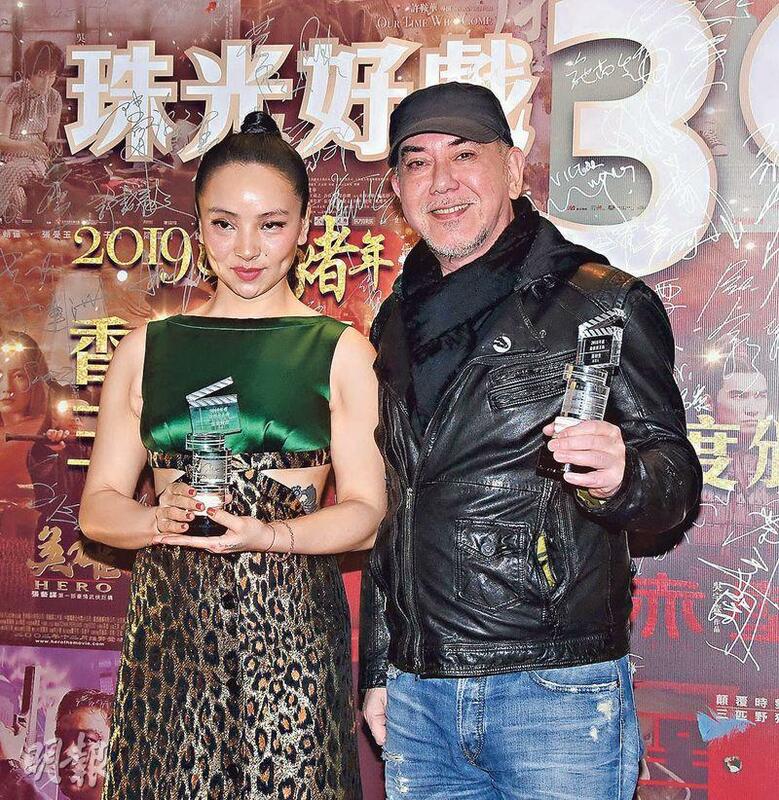 Anthony Wong Chau Sun and Chloe Maayan won Best Actor and Best Actress. Chau Sun took the opportunity to thank the government for allocating HK$ 1 billion for the Film Development Fund, thank Chief Executive Lam Cheng Yuet Ngor for supporting Hong Kong film's development and the crowd returned with enthusiastic applause. President Lau Wai Keung's four year term ended as he handed the baton to the new president Mabel Cheung Yuen Ting. Seven awards were presented that night. Wong Chau Sun with STILL HUMAN (LUN LOK YUN) and Chloe Maayan with THREE HUSBANDS (SAM FU) won Best Actor and Actress, Best Film went to PROJECT GUTENBERG (MO SEUNG). PROJECT GUTENBERG's director Felix Chong Man Keung also won Best Director. Best New Actor went to STILL HUMAN's Crisel Consunji. STILL HUMAN's director Oliver Chan Siu Keun won New Director. The "Executive Committee Special Prize" went to I'VE GOT THE BLUES (SHUI DAI HUNG JAU DIK YUN). Passing away at the end of last year, Ringo Lam Lan Tung received the "honorary award". New Directors' Guild president Cheung Yuen Ting lamented, "Last year he suddenly passed away, which was a loss to the film industry. We hereby express our deep sorrow, as we would always remember him. This award is truly deserved." When Tsui Hark accepted the award on his behalf he said, "I really miss him, his wife and son are very low key. They both have always missed Ah Tung, so they don't want to bring any sorrow to this joyous event. I would accept the award on their behalf, I hope the Guild would understand." Everyone gave a standing ovation to salute Lam Lan Tung. Winning Best Actor and Best Actress again after the Film Critic Society Awards, Chau Sun joked, "When I heard the result I froze, it is real or fake? Is producer (Fruit) Chan Gor is a strong force in the Directors' Guild? Winning this award I feel very incredible, honored and happy, beacuse directors are the most difficult to serve organisms in the entire universe. Receiving the recognition of so many directors is the greatest achievement in my life." With Chief Executive Carrie Lam Cheng Yuet Ngor present, he stated that he had to say a few words to her. The entire crowd cheered. Chau Sun joked, "It's very rare, usually when I say stuff like this it gets all quiet. Over the years my name is much like Voldemort's, the film industry can't mention the name Wong Chau Sun. I really have to thank the government for allocating HK$ 1 billion to support the Hong Kong film industry. I represent myself to thank the Chief Executive for her support." Chloe Maayan really appreciated what Chau Sun said, "It's a great enjoyment, because he is very humorous." Would she like to work with Chau Sun? She said, "I would!" Chau Sun sad, "Do you want to make Roast Pork Bun (UNTOLD STORY)? Forget ti! Let's make a romantic drama!" Chloe Maayan never thought that she would win an award and remained emotional. Was she more confident about winning the Hong Kong Film Award? She admitted that she had confidence and at the same time admired each nominated actress, including herself. Chau Sun reminded her not to let all the awards go to her head. Chloe Maayan hoped that they would have a chance to work together. Lau Wai Keung ended his four year presidency and handed the baton to the new president Mabel Cheung Yuen Ting. Lau Wai Keung said, "She was the vice president, we had ample communication. The Directors' Guild finance is healthy, the most important is to maintain the harmonious spirit of the Directors' Guild over the years. The new generation and the older generation would be able to talk." Cheung Yuen Ting said, "I have no pressure, I am very fortunate. I am a 'rich kid' because earlier the Guild shot the old location and made some money. Some projects have steady revenue and the government allocated HK$ 1 billion for the Film Development Fund. Everyone together would take Hong Kong film to the next level." Lau Wai Keung said from experience, "The most important to find new revenue and save on expenses, passing the torch. With steady income, let's see if she will be a big spender." Cheung Yuen Ting aid that by rule the Guild would have several million in steady fund. The Directors' Guild would also start teaching classes to help new directors with film productions." The Hong Kong Film Directors' Guild 30th anniversary dinner and awards nights ago brought together many artists, like Charlene Choi Cheuk Yin, Karena Ng Chin Yu, Jessica C. and her husband Andy Tien (On Chi Kit), Lo Hoi Pang, Kara Wai Ying Hung, Francis Ng Chun Yu, Anthony Wong Chau Sun, Kenny Wong Tak Bun, Nancy Wu Ting Yan, Alex Fong Chung Shun, Nina Paw Hee Ching, Fiona Sit Hoi Kei, Stephy Tang Lai Yan, Shu Qi, Shawn Yue Man Lok and others. Ah Sa with the film THE LADY IMPROPER (FEI FUN SHOOK NUI) was nominated for the Hong Kong Film Award Best Actress. Would she campaign for votes at the Directors' Guild dinner? Ah Sa was resistant. "Can I get any? If it works back then SARA (CHOR GEI) would have won. Asking people to vote for me is very lame. It's hard to say out loud. Maybe I can just ask everyone to see the movie, I am cool you know." Was she more confident this time than with SARA? She said, "Every time is almost the same because each year the voters are different. It would depend on the film genre they like. (Do you know what you would wear?) Not yet, but I have started working out in preparation because I don't know what the designer would prepare for me. I haven't won Best Dressed, so I would first work hard on myself. (Are you nervous yet?) I still feel the same, everyday I have a lot of work. In addition lately I have been in film negotiation, I am only thinking about the character in my head." Karena Ng Chin Yu last year worked in the Mainland half the time. Did she have time to see her boyfriend? Chin Yu said, "Dating isn't important, if we are happy then we would when we are free. I feel work is more important. If the other half understands then that's even better. I won't consider marriage until a few years later. (Do you and your boyfriend have an understanding?) No, it's too soon. Girls have to have their careers, not to mention that I just started on television." Speaking of her old flame Raymond Lam Fung and girlfriend Zhang Xinyue would soon wed, Chin Yu said, "Rumors constantly surface, many aren't true. I no longer have any contact with him. (Are you no longer friends?) Not really. (Would you mind working together?) I am not talking anymore, if the chances arise then ask me. Actually it doesn't matter, but I feel this chance won't come. This circle has many people, we might not work together just like that." Chow Yun Fat while working on the film GIU YEUNG SHUI YUET suffered an injury in an accident with Kenny Wong Tak Bun. Alex Fong Chung Shun was also present on the set that day. He said, "Originally he said he was fine, so when we saw blood we were very puzzled. Yet Fat Gor kept acting and didn't call for a stop. I was curious why the fake blood was so light. Its color should be darker." Fong Chung Shun joked, "Tak Bun this time is really in trouble, if he hit me he would be fine. At most he would just take me to a dinner or two. He nailed a Hollywood superstar, this time he definitely would be famous. I already told him to go to the Kowloon City Market, because lately when I went food shopping many stall owners asked me about Fat Gor's condition." Fong Chung Shun said that Fat Gor after stitches immediately came back to work. "At the time Fat Gor wanted to go to a government hospital due to the distance. I said the government hospital would definitely shave his head and also have reporters. In the end we went to a private hospital."